Rehabilitating Wooded Island and Installing Yoko Ono's "Sky Landing"
The temporary heavy equipment bridge through the west lagoon. Jackson Park's Wooded Island is currently closed to the public while it is being reworked by a consortium of groups led by the Army Corps of Engineers, but last Saturday the Chicago Park District offered a special tour of the island's rehabilitation and Yoko Ono's in-process sculpture,"Sky Landing." Construction equipment on the bed of the future Thornton Reservoir. Trucks on the Tri-State Tollway can be seen above the quarry. On Saturday, I joined the Southeast Environmental Task Force (SETF) on one of its tours of Chicago's goliath infrastructure. 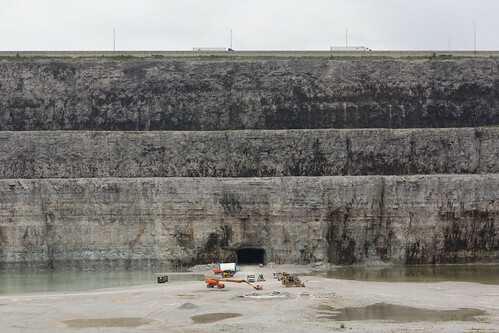 The tour featured the future site of the Thornton Composite Reservoir, the largest such reservoir in the world, and a Deep Tunnel pumping station 350' below ground at the Calumet Water Reclamation Plant. Both are part of the Metropolitan Water Reclamation District (MWRD)'s gargantuan Tunnel and Reservoir Plan, the multi-decade, multi-billion dollar project designed to protect the Chicago region from the flooding and pollution caused by overflowing sewer and stormwater infrastructure. Calls to label genetically modified organisms, or GMOs, are sweeping across the country. Last year, more than 20 state legislatures were considering GMO labeling bills. Studies show the majority of Americans support this effort. But in Illinois, the call for GMO food labeling has proven a fruitless endeavor thus far. Since the emergence of Asian carp in the Chicago River and other major bodies of water connected to Lake Michigan, there has been the worry over Asian carp getting in the lake. Asian carp are native to China and almost sound like a fish seen in a cartoon. Asian carp can reportedly jump very high and have been known to hit boaters in the face, causing injury. The Asian carp can also grow to up to five feet long and weigh 100 lbs. Toni Preckwinkle has been recognized with the Midwest Energy Efficiency Alliance's (MEEA) Inspiring Efficiency Leadership Award for her work in improving energy efficiency in Cook County and thus saving county taxpayers millions of dollars. "Toni Preckwinkle and Cook County have raised the bar for other counties and municipalities across the nation," said MEEA Executive Director Doug Newman, in a press release. Over the past several years, the Preckwinkle administration has helped create a vision for sustainability by implementing projects and creating the County's first Sustainability Advisory Council. Through the Guaranteed Energy Performance Contracting (GEPC) project, the largest of its kind, the Administration will make energy upgrades to county hospitals and the jail, which in turn reduces energy emissions by 20 percent, creates 600 construction and technology jobs, and secures $237,000 in Illinois energy rebate revenues in 2013, with more than $1 million projected in 2014, according to Deborah Stone, chief sustainability officer for Cook County. The County was able to undertake this project at no cost to taxpayers, by securing low-cost financing through the second largest use of Qualified Energy Conservation Bonds in the State of Illinois, said Stone. In 2013, the County was selected as a nominee for the Chicago Innovation Awards for its sustainability efforts. "I believe that Cook County should be a world-class model of sustainability," said Toni Preckwinkle. MEEA presented the award to Preckwinkle at the Midwest Energy Solutions Conference last week. 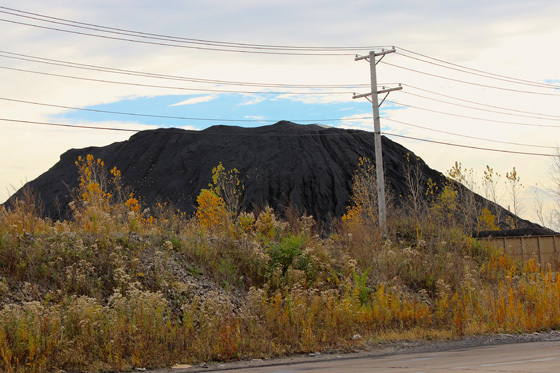 Residents in Chicago's Southeast Side and South Deering neighborhood complain that black dust from petcoke piles along the Calumet River is polluting their communities. "I have black soot in my windows and my curtains are completely black," Cathy Hibbard, a Southeast Side Chicago resident said in an interview. "If I open up my windows, I get that stuff all on my kitchen counters. It's horrible." 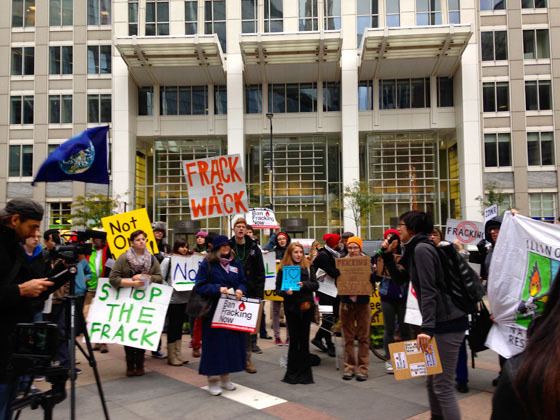 This past Friday, over 100 demonstrators gathered outside the Illinois Department of Natural Resources (IDNR) in Chicago's Loop to protest hydraulic fracturing (fracking) in Illinois. The event was convened by Chicagoland Against Fracking and Chicago Youth Climate Coalition and was part of The Global Frackdown, a larger movement of anti-fracking demonstrations across the world. 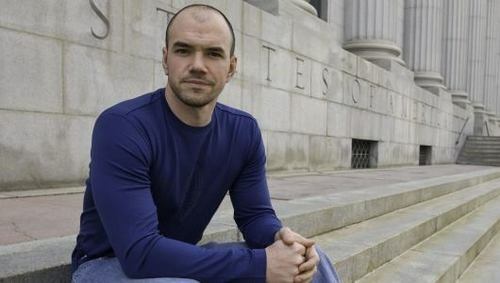 Influential climate justice activist and co-founder of the environmental group Peaceful Uprising Tim DeChristopher will be in town with acclaimed writer Terry Tempest Williams this Friday evening at Chicago History Museum. What would happen if a tornado hit a million-gallon tank full of fracking wastewater in southern Illinois? I don't know for sure, but I suspect the result would be to spray the countryside with poisonous waste. If legislators don't know, they need to pass a fracking moratorium, as five Illinois counties have already called for, alongside any bill that would open up Illinois to fracking. The 2008 decision to privatize Chicago's parking meters has always been unpopular. Forget for a moment that they are now the nation's most expensive parking meters, or that Chicago Parking Meters LLC is trying to fleece the city for $22 million dollars. Instead, let's think about the environmental impact of the meters, managed by LAZ Parking. By our estimation, Chicago's parking meters generate nearly 45 tons of unrecyclable trash a year. We'll explain. 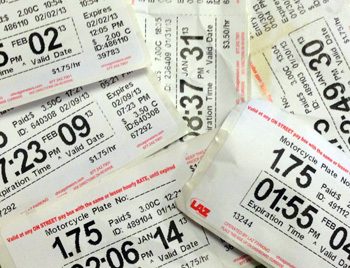 First, let's look at the parking receipts themselves -- stickers mounted on plastic-coated paper. The stickers are meant to accommodate the small number of motorcyclists who must affix the receipt to their headlamp. According to the EPA, most stickers cannot be recycled due to the "pressure sensitive adhesive" backing. (One exception being Post-It Notes, which have a lighter coating of adhesive that can be removed in the recycling process.) Similarly, coated paper may or may not be recyclable depending on the coating used. LAZ Parking would not discuss details, citing company policy against sharing "proprietary information." As the fifth largest governing body in the state of Illinois, the Metropolitan Water Reclamation District race, while not typically prominent in the election cycle, is an important one. The MWRD serves the City of Chicago and 125 suburban communities, and is primarily responsible for wastewater treatment and managing stormwater runoff. It's an agency that has been slow to change, resistant to EPA regulation, and hesitant to adopt green technology and infrastructure. And yet, it has been an exciting year for the MWRD. In June the MWRD agreed to disinfect effluent going into the Chicago River, ending a decade long battle. In early October CDOT announced the opening of the "Greenest Street in America." MWRD partnered with CDOT to design a streetscape capable of capturing 80% of typical rain showers instead of sending that water into the city's sewer system. There is plenty of more work to be done. Stormwater management will be important in this next term. Projects like the Pilsen roadway project point the way, while voters wait for the completion of the Deep Tunnel Project (formally known as the Tunnel and Reservoir Plan, or TARP). Still decades away from completion, TARP is vital, but a hallmark of old methods of stormwater management. 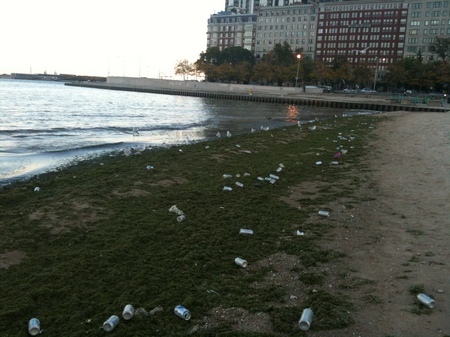 Chicago needs a MWRD that is a leader in innovation and green infrastructure. "The best app of all is the city," said panelist Andres Duany, co-founder of Congress of the New Urbanism, at the Center for Neighborhood Technology (CNT)'s Reinventing Chicago discussion last night. "The way it works -- its legibility, its grid, its ability to evolve independently -- could be very useful." 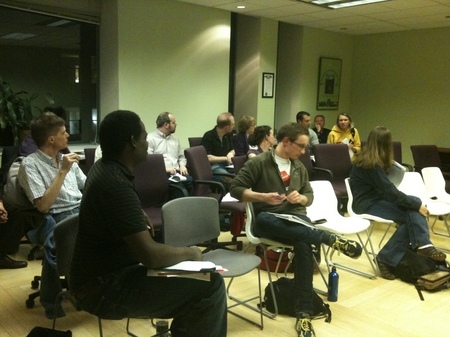 Last night's discussion kicked off the first Urban Sustainability Hackathon. The Hackathon is an opportunity to programmers to meet with urban thinkers and problem solve new digital tools for Chicago. Participating programmers will have access to CNT's data as well as 65 sustainability data sets from the City of Chicago. 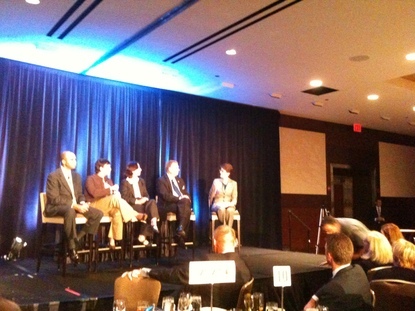 Chicago Chief Technology officer John Tolva and CNT President Scott Bernstein were also on last night's panel. Tolva said the City is committed to making more data available. "What we've talked about is the economic development potential of this data. This is the basis of business, it is the basis of a whole range of apps that people have been making money off of. We see this as a raw material." Hackathon programmers will compete to win Nexus 7 tablets, I-GO memberships, and a fundraising video for their app from Mothlight Pictures. Apps will be judged by representatives from Kellogg School of Management, Smart Chicago Collaborative, CityScan, and Hyde Park Venture Partners. If you are interested in participating in the Hackathon sign up on the website and join CNT tonight at 7pm at TechNexus on 200 South Wacker Drive to meet other programmers and form your team for the weekend. President of Chicago Teachers Union and Pilsen Environmental Rights Organization on Democracy Now! Jeanne Gang is most commonly associated with the landmark 82-story Aqua building on Chicago's "New East Side." The undulating tower mirrors the river it shadows over and reflects the lake into which its views spill. Water has become a preoccupation for the MacArthur Genius; her designs not only reflect water as a form, but speak to water systems on the whole as meshing with the built environment. Nowhere is there more on display than in Gang's new book Reverse Effect, an innovative design plan that seeks to restore the natural Mississippi River and Great Lakes' watersheds, implement permeable green infrastructure, and reclaim vast swaths of underutilized land along the Chicago River for redevelopment. Gang's plans for the Chicago River's remediation were revealed in a late November talk at the Harold Washington Library with Steve Edwards of WBEZ and Henry Henderson of the Natural Resources Defense Council. As illustrated in the book's title, Reverse Effect proposes the incorporation of green infrastructure as a way to mitigate the concern of invasive species threatening the entire water system from the Great Lakes down through the Mississippi River to the Gulf of Mexico by restoring the natural watersheds of the Great Lakes Basin and the Mississippi River. Specifically, Gang proposes erecting a barrier near Bubbly Creek, the still-simmering toxic repository of the Chicago River on the border of the Pilsen and Bridgeport neighborhoods. With the barrier in place that separates the watersheds back to their natural state, and the introduction of adjacent green space to act as wetlands around Bubbly Creek, Gang's designs would work to recharge the lake, and provide an opportunity to reclaim the surrounding fallow, industrial land for redevelopment. As Gang stated, "this water problem is an urban problem. Our solution is to make the urban solution a water solution." Chicago Mayor Rahm Emanuel is marching forward with designs to revitalize the Chicago River for recreational use. As he does, the mayor would be wise to look towards other cities worldwide who have undertaken their own river reclamation projects and apply their lessons here. The main question Emanuel needs to be asking is how does turning attention to a long-neglected urban waterway make way for economic growth, increased quality of living and mitigating climate change? The most definitive answers can perhaps be found trickling through the Cheonggyecheon in the heart of Seoul, South Korea. In the 2009 New York Times article "Peeling Back Pavement to Expose Watery Havens," Andrew Revkin writes of ambitious projects in cities around the world seeking to remediate, reconnect, and unlock the economic potential hidden in the waterways that flow through their borders. In Seoul, the $384 million removal of three miles of elevated highway allowed the Cheonggyecheon to reclaim its rightful place as one of the great gathering spaces of the ancient city. The Cheonggyecheon was an integral component of the city since the days of the Choson Dynasty nearly 600 years past, yet the stream had been replaced with a traffic-choking roadway in the name of industrialization. As the utility of the elevated highway began to wane, officials tore down the highway and returned the Cheonggyecheon to its rightful place. Despite criticisms from some corners that claim the waterway reclamation project's cost outweigh the benefits, cities around the world are taking Seoul's example to heart and aiming to unravel their own urban rivers and streams. As Revkin stated in 2009, "The restoration of the Cheonggyecheon is part of an expanding environmental effort in cities around the world to 'daylight' rivers and streams by peeling back pavement that was built to bolster commerce and serve automobile traffic decades ago." The movement towards re-opening waterways has only gained force since then, and is part of a broader effort cities are undertaking to create vibrant, livable spaces that attract top-tier talent to settle, work, and live within the confines of the urban area. From Los Angeles to Chicago to Yonkers, NY, the example of Seoul is weighing heavily as American cities begin to retrofit their natural amenities to increase the sense of place that make cities attractive in the first place. For American cities on the whole, this means applying a different mentality towards the way in which the economic return of their waterways and natural amenities are harnessed, but not necessarily a wholesale culture change in which environmentalism is the prevailing meme. Economic utility is still the motivating force; it's simply that the utility now is found in having accessible and navigable open space. For a city like Chicago, this means taking the Chicago River and putting it to good use for economic purposes in the same sense it always has, yet doing so in a way that provides for lasting and sustainable development. The river has traditionally been treated with less than great intentions and care throughout the city's history. While the river opened markets and created a reason for permanent settlement in the region, it has historically been an exploitable resource that has been utilized as a dumping ground, sewage container and sink. 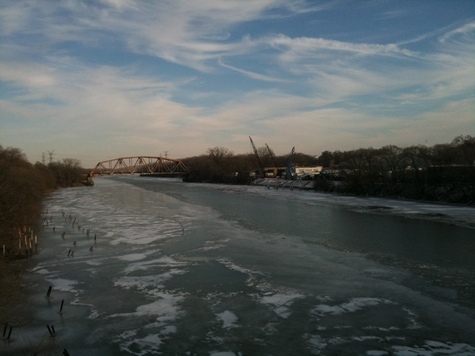 The industrial concentration and wasting of the river not only led to one of the great engineering marvels of America- the reversal of the Chicago River's flow- but also to the still simmering remains of the toxic Bubbly Creek in the Bridgeport neighborhood. The return from Seoul has gone beyond the economic as well. A piece from the online journal Grist notes many of the collateral benefits that have resulted from the return of the Cheonggyecheon. Among them are the creation of more value-adding public places, an increase in the species of fish and birds and various wildlife to the city, and a reduction of 5.6 degrees F in the surrounding area, cooling off the "urban island" effect. Domestically, cities like Pittsburgh - with its Walls Are Bad campaign - have begun to see the returns of remediating their waterways into recreational powerhouses. Recently, the Los Angeles River has begun to be revitalized in a fashion other than just a hidden repository of junk. Chicago is taking steps to harness the potential of its namesake river, with Mayor Emanuel recently declaring "Much like Lake Michigan is Chicago's front yard, the Chicago River is our backyard, and should be an asset that people across the city enjoy, not avoid." For a city needing a flow of cash into its coffers, it's time to wade in. This post also appears on CNU.org. Rainwater In Context: Is Chicago's Water Rate Increase Money Down the Drain? As many cities face both costly aging infrastructure and looming budget deficits, public administrators are turning to fee increases to finance system fixes. Most recently, Chicago Mayor Rahm Emanuel's proposed 2012 budget outlines an up-to-25% increase in the annual fee for water and sewer services. The Congress for the New Urbanism supports Chicago's water modernization efforts, but the Mayor's proposed fee lacks a direct connection to urbanism and green infrastructure. A rate increase that only patches sewer pipes will flush taxpayers' money down the drain. If this water rate increase only helps the City rebuild - instead of renew - water infrastructure, the same stormwater problems will plague the City's streets. Innovative and context-sensitive rainwater systems are not only sustainable and environmentally friendly, but also cost-effective. Green water infrastructure, the type(s) as proposed in CNU's Rainwater-in-Context initiative, helps reduce stormwater runoff and its stress on the sewer system. Permeable pavement, alternative street design, and other context-sensitive rainwater systems protect urban watersheds like Chicago's - undoubtedly one of the city's greatest assets. The current state of disrepair of Chicago's water infrastructure should be viewed not as a liability that can only be remedied through higher rates for fixes, but rather as an opportunity to create longer-lasting, more sustainable systems that securely plant Chicago at the forefront of green design. As the Mayor is wont to say, "You never want a serious crisis to go to waste." 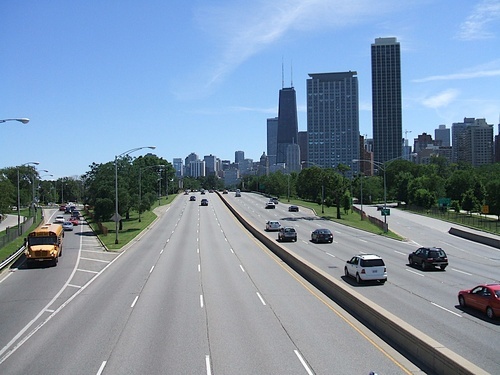 Dense urban areas like Chicago have inherent environmental strengths (especially when compared to conventional sprawl patterns), and incorporating urban-minded water infrastructure can only enhance this standing. In committing to both green infrastructure and new urbanism, Mayor Emanuel has the opportunity to realize sustainable practices that reinforce the urban environment and protect the City's and taxpayers' assets for the long term. Chicago helped pioneer interdisciplinary water and street planning, such as its Green Alley program. Dedicating water rate increases to broadly implementing urbanist green infrastructure keeps Chicago a leader in sustainable water policy. Mayor Emanuel's budget proposal to address inefficient water pricing is only part of a more comprehensive solution to better managing Chicago's watershed. Green - and urbanist - water infrastructure will shower rewards on both local government's coffers and taxpayers' pockets. Caitlin Ghoshal is the Program Manager for the Congress for the New Urbanism, and served as a Mayoral Fellow in the Office of Mayor Rahm Emanuel during the Mayor's first 100 days of office. For more information on CNU's Rainwater-In-Context, please visit http://www.cnu.org/rainwater. Feeding the poor wasn't enough for one faith-based non-profit on the North Side. A Just Harvest, a community kitchen turned community organizer, is planning a tilapia farm in the North of Howard area. The main feature of the project would be an aquaponics farm that would produce both locally grown food and, ideally, jobs. The scope of the project isn't your garden-variety urban greenspace. The goal is to construct an aquaponics system that would produce two yields of tilapia in the first year alone. Like a home aquarium, an aquaponics system pumps wastewater out of the fish tank to keep the fish healthy, but that's where the similarities end. Instead of using a mechanical or disposable filter, the wastewater from the fish would in turn be pumped to a separate area with a bed of produce. The water is then filtered by the plants and simultaneously used as fertilizer before being pumped back in to the fish tank as clean water. Depending on the size of the tank used, the amount of fish can be anywhere from a few hundred fish to tens of thousands. Chicago has a reputation of being one of the greenest cities in America, but just how green are its residents? Have the city's initiatives like the Green Alleys program, which incorporates permeable pavements in alley design and diverts rain water away from the sewer system, created more environmentally conscious citizenry? In June a resident of the Little Village neighborhood completed the 100th rebate of the year for the Sustainable Backyard Program. He or she will get cash back for installing either a rain barrel or compost bin, planting a tree or creating a native plant garden on their property. In a city with millions of residents the 100th participant in a program like this doesn't seem like much of a milestone, but yet it is. The 100 participants in the Sustainable Backyard Program have surpassed the number of participants from last year. About half of the participants this year indicated the reason for installing a rain barrel, compost bin, native plant garden or planting a tree was the promise of getting cash back for doing so. The funds for the rebates come from a US Environmental Protection Agency's Pollution Prevention Program and a USDA Forest Service Grant. During a phone conversation with Lyndon Valicenti, WRD Environmental project manager for Chicago Department of Environment, she informed me that the program had 5,000 rebates to give to residents last year. Eight hundred were handed out at workshops designed to educate Chicagoans on rain barrels and compost bins. "We had about a 7 percent return rate. 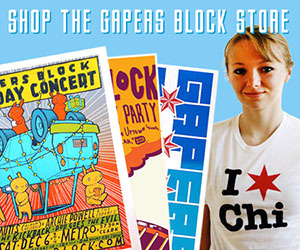 So, we're working to get the message out to Chicagoans to participate," Valicenti said. Committee chairs Virginia Rugai (19th) and James Balcer (11th) did not call a vote at today's hearing, saying that the issue requires more scrutiny and investigation, even though the Ordinance was introduced more than a year ago and a majority of City Council members have signed on as cosponsors. It is now likely that Clean Power Ordinance will be decided under Mayor Rahm Emanuel and the next City Council. Despite the setback, two local environment groups sent out e-mails to supporters this week detailing even more health problems associated with coal-fired power plants like Fisk and Crawford, which emit thousands of pounds of dangerous skin, lung and organ toxins. 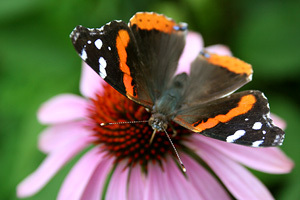 These toxins can cause severe health problems, especially in residents who live near the plants. After a year of battles, lobbying and hopeful waiting, the Clean Power Ordinance, long-awaited legislation that would reduce pollution emitted from the Fisk and Crawford coal plants in Chicago, might see life outside of council committees. Supporters of the ordinance will gather at 9:15 this morning outside Council Chambers (the 2nd floor of Chicago City Hall, 121 N. LaSalle St.), for a press conference about the ordinance, followed by a Health and Energy, Environment and Public Utilities committees hearing. 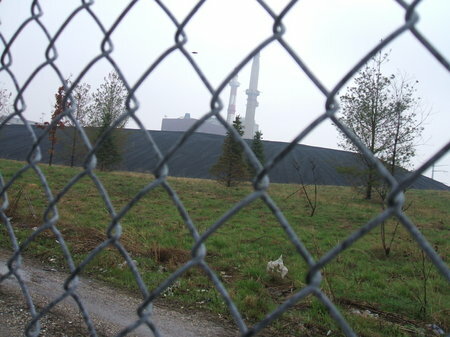 The proposed ordinance, introduced last year in City Council, sets standards for two of Chicago's worst polluters -- Fisk Generating Station and the Crawford Generating Station -- to limit harmful particle matter (soot) and Carbon Dioxide emissions. At a Sierra Club meeting on the topic last year, proponents argued that these limits are feasible for both the coal-burning plants, which were built in the 1950s and were often exempt from certain regulations because of their age. Online resources providing protection tips against lead poisoning recommend isolating children from sources of lead. As a rule of thumb, this entails opting out of locating the nursery in the room with peeling paint from forty-years ago or choosing to plant grass over lead-saturated soil instead of turning it into the sandbox (the latter typically involving the consumption of large quantities of sand in the form of mud pies.) Recommendations for protecting against lead include efforts as minimal as using duct tape or contact-paper to cover a lead-paint section of the house. What about when your exposure to lead emanates from a non-isolatable source, let's say, when it saturates your neighborhood from a remote location through our most precious and fundamental compound - the air we breathe? How do we place a shield between ourselves and some as yet unknowable source? Should we duct tape or contact-paper our power plants, construction sites and areas of high traffic? Haunting images of Chicago's polluting Fisk and Crawford coal-fired power plants, which Little Village and Pilsen residents have sought to shut down for years, are slowly becoming more familiar to city residents as more media organizations report on the concerning environmental topic. This video, however, shows an even deeper side to the weight of coal. Uploaded by YouTube user John Sheehan, or dogstar7, it shows tons of coal passing through the city on freight trains. An impressive crowd of about 75 turned out a few nights ago at Gill Park to hear the two runoff candidates for alderman in Chicago's 46th Ward, Molly Phelan and James Cappleman, weigh in on transportation issues at a forum hosted by Walk Bike Transit (WBT) , a newcomer to the political scene who may end up having an important impact. The non-partisan WBT says its mission is "to mobilize voters throughout Chicagoland [on] biking, pedestrian, and transit issues." The event was the first in a week of near-nightly matchups between the two would-be successors to Helen Shiller, and, while billed as a forum rather than a debate, it nonetheless offered insight into the contrasts between the candidates as well as showcasing the interest in issues affecting those who use their own footpower, or public transportation, to get around. This piece was submitted by Martin Macias, Jr. The Chicago Clean Power Coalition comprised of over 50 health, community, environmental and business groups, shared something in common recently with the "Anybody but Rahm" contingent of the Chicago electorate...briefly succumbing to the joy of witnessing the fruition of poetic justice, only to be struck down by the daisy cutters barring bad news. On January 27th it was discovered that an official Health Committee hearing, which was slated to take place on the 14th, was delayed indefinitely by Daley Administration allies in the City Council. However, the coalition announced that they will move forward with a "People's Hearing" in City Council chambers on February 14th. Alderman James Balcer (11th) is the new chair of the Health Committee and would've presided over the first council hearing that examined the Clean Power Ordinance introduced by Aldermen Joe Moore (49th) and sponsored by 16 other Aldermen. A majority vote of the joint committee is needed for the legislation to advance to a vote by the full City Council. Chicago's mayoral candidates have a lot to consider if they want to keep several local environmental and transportation advocacy groups supportive and engaged. In recent months, organizations have released detailed reports on how to make Chicago a more progressive and sustainable city. [For more on the loaded word sustainable, check out Ben Schulman's latest post]. 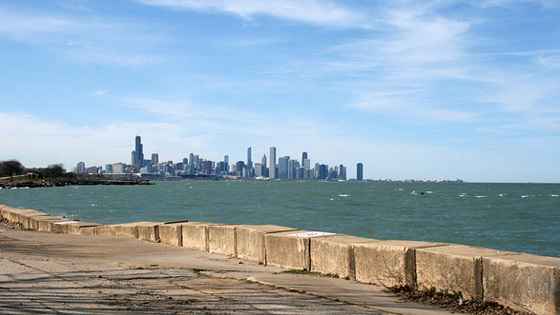 The Chicago Metropolitan Agency for Planning unveiled its GO TO 2040 plan in October, and last week, the Center for Neighborhood Technology released its "Investing in a Better Chicago" report. Most recently, the Metropolitan Planning Council, Active Transportation Alliance and six other Chicago organizations collaborated on a Sustainable Transportation Platform, a report outlining ten priorities that the coalition is urging mayoral candidates to support in order to make transportation safer for bicyclists and pedestrians, and more efficient for all commuters. As the first decade of the new century comes to a close, the term "sustainability" deserves inclusion on the long list of buzz words and popular trends that have made up the cultural canvas in recent times. All sorts of green boosterism has arisen in the past few years as a clever marketing tool, especially from companies most vulnerable to the march towards sound environmental practices, as seen in commercials from the likes of BP and Toyota. The use of the word sustainability as a catchy marketing term doesn't diminish the legitimate intent behind the process that seems to be taking place, but its lazy application is reminiscent of 19th century bloodletting or perhaps more aptly, the mid-'90s Saturday Night Live "Crystal Gravy" commercial. Remove the direct impediment -- the bad blood, the heavy brown sludge of gravy, the easily seen sprawl of space and pollution of unclean energy -- and the problem is magically solved. Again, there's no doubt that the intentions behind the greening of resource use is a real and noble purpose, but the problem with the majority of the current commercialization tactics being employed is that it makes something serious and concretely needed feel like a fad. The call for sustainability is being treated as an emotional argument, which tends to create a chasm between those who intrinsically feel compelled to agree with sustainable practices, and those who don't. Therefore, it ends up becoming a divisive issue between those who "get it" and those who fall on the periphery of the argument. Today marks the official launch of MetroPulse Chicago, a new website that is the heart of the joint Regional Indicators Project being championed by The Chicago Community Trust and the Chicago Metropolitan Agency for Planning (CMAP). MetroPulse acts as an open-source data platform that allows press outlets, government officials, and concerned citizens to access over 20,000 data sets on 200+ different indicators that track quantifiable issues throughout Chicagoland. Using a broad array of indicators, from unemployment to foreclosure density to infant mortality rates to political participation, MetroPulse provides a picture of quality of life as measured in data. The site serves many purposes, no small part being an ongoing checklist for the implementation of many of the recommendations of CMAP's GO TO 2040 Plan. By making such an aggregation of information readily available to any and every interested party, the Community Trust and CMAP are truly providing a means for mass engagement in development and community issues. While a site as exhaustive as MetroPulse will require constant upkeep and inputs of new data, its ability to level the playing field in terms of access to the details that shape the region - with both elected official and constituent feeding from the same source - carries the potential to change the tenor of discussion between political bodies and their public into something more frank than normal. 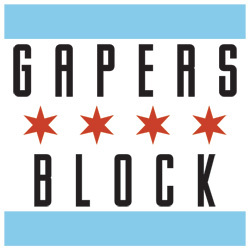 Give your neighborhood a test run on the site now, and start thinking about all the questions in store for those aldermanic candidates popping up all over the place. Potential mayoral candidates take note: in a city where politics are often viewed through a prism of black, white, or brown, a broad-based coalition will be demanding that a green hue merit equal consideration. 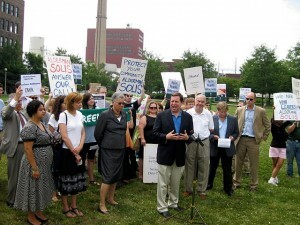 The Chicago-based Environmental Law and Policy Center (EPLC), one of the midwest's foremost think-tanks and advocacy centers, is spearheading a drive to bring issues of sustainability and environmental quality to the forefront in the Chicago municipal elections, which will rear their head the moment the dust settles on the Nov. 2 general election. ELPC already has a survey in progress to show that voters care. This article was submitted by Chris Didato. On Thursday, two national environmental groups, the Sierra Club and Greenpeace, joined Alderman Toni Preckwinkle and the Chicago Clean Power Coalition in their effort to pass an ordinance that would limit the emissions of two South Side coal-fired power plants by 90%. At the press conference, held in Pilsen's Dvorak Park, with Midwest Generation's Fisk plant looming in the background, included several aldermen and community supporters, Sierra Club Executive Director Michael Brune, and Global Warming Campaign Director Damon Moglen. All gave the Chicago Clean Power Ordinance their support. The proposed ordinance, introduced by Alderman Joe Moore (49th Ward), would have the two coal-fired power plants in Chicago limit their emissions of "particulate matter" (or soot) and carbon dioxide. Above: Live video of the crude oil gushing from the BP well in the Gulf, right now. Imagine if a tanker the size of the Exxon Valdez capsized off New Orleans, unleashing a flood of oil on the magnitude of that 1989 environmental disaster. Now imagine that a crash and spill like that happened once a week for the past month-and-a-half. Would that get your attention? The latest best estimates from the U.S Geological Service's Flow Rate Technical Group gauge the gush from the BP well at between 25,000 to 30,000 barrels per day, with a possibility of as high as 40,000 barrels per day. That's an estimate, note, of the rate before the recent cutting of the riser pipe, which may have increased flow further. In other words, tanker-size volumes of crude oil, equivalent to the 250,000 barrels that poured out of the Exxon Valdez, have been spewing into the Gulf at least every eight to 10 days since April 20, and maybe every six days. This is not just the worst offshore oil spill in U.S. waters, it's rapidly becoming one of the worst pollutings of the planet's oceans, ever, under our very noses. Yet today it was buried on p.16 of the Tribune, trailing not only the Blagojevich trial and the Blackhawks pub crawl, but stories about the Burge torture trial, a little girl whose kayak capsized, and -- this is news? -- the pope coming out in favor of celibacy for priests. The other day, some activists demonstrating in front of Jan. Schakowsky's office for removing oil companies' liability caps (which Schakowsky supports) reported back that numerous passers-by had no idea about the BP spill. In other words, one of the worst environmental disasters of our time is ongoing, but to many Americans and much of the media, it's a yawner -- or even a non-event. How can this be? The answer lies at least in part in the under-reporting and downplaying of the disaster that began almost immediately. If there has been a frog-in-the-crockpot lack of awareness about the magnitude of the gusher, it's in part because a flow of misinformation has accompanied the flow of oil from Day One. A review shows that this misinformation almost certainly had to be deliberate. If the threat of criminal prosecution by the Justice Department is anything more than show, the obfuscation of reality ought to be a target of the investigation as well. Blair Kamin has evaluated Mayor Daley's "vaunted" green roof program. He's not impressed. --They're not all created equal. Media accounts of green roofs in Chicago invariably focus on the sprawling, lushly planted City Hall roof, or Millennium Park (left), which is built over working commuter railroad tracks and outfitted with grass and trees. These are the Rolls-Royces of the genre. More typical is a tiny green roof atop an Aldi supermarket at 4450 N. Broadway Ave., visible from the Chicago Transit Authority's Red Line. It resembles a postage stamp. Green roofs, it shows, can comply with the law without adding much beauty to the cityscape. Inside the Sierra Club's Chicago offices off of Lake Street, just a few days before Earth Day, a group of about 15 people gathered this week to discuss effective ways to lobby for the clean power ordinance. The proposed ordinance, introduced last week in City Council, calls for two of Chicago's worst polluters -- Fisk Generating Station and the Crawford Generating Station -- to limit particulate matter and Carbon Dioxide emissions. Proponents argue that this is technologically and financially feasible for both the coal-burning plants, which were built in the 1950s and were often exempt from certain regulations because of their age. Fisk and Crawford, owned by Midwest Generation, are both located on the city's South Side in predominately Mexican neighborhoods. The plants release thousands of pounds of dangerous skin, lung and organ "toxicants," severely affecting the air quality and health of millions in the Chicago area, especially Little Village and Pilsen residents. The ordinance cites a 2001 Harvard School of Public Health study (.pdf) that states air pollution specifically from Fisk and Crawford causes more than 40 deaths, 550 emergency room visits and 2,800 asthma attacks every year. At Tuesday's Sierra Club meeting, several of those in attendance shared their personal stories: one gentleman said growing up in Michigan, his allergies were rarely a problem, but when he moved to Chicago, his allergies became so severe that doctors suggested he try taking steroids to control them. Another young man from California said he never had an asthma attack until moving to Chicago. "We've come together because we realized if you're going to take on such a huge issue as trying to clean up the coal power plants, we all have to work together," said Tony Fuller, a volunteer with the Sierra Club. "We need people to reach out across the city, that's why it's so important. The aldermen, unless they hear from their constituents, they're not going to take action." The ordinance is sponsored by Ald. 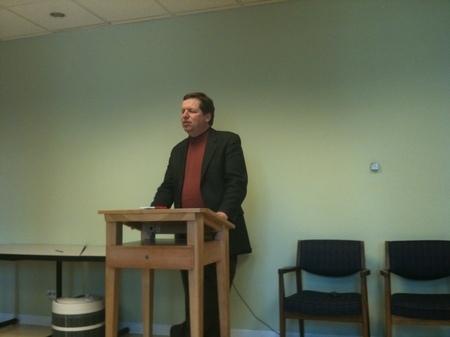 Joe Moore (49th), who also spoke at length on the topic at Tuesday's meeting. Co-sponsors include Toni Preckwinkle (4th), Sandi Jackson (7th), Toni Foulkes (15th), Joanne Thompson (16th), Sharon Dixon (24th), Scott Waguespack (32nd), Rey Colon (35th), Eugene Schulter (47th) and Mary Ann Smith (48th). If the Asian carp ever manages to colonize Lake Michigan, it will join a long roster of ugly foreign marine life that has invaded the Great Lakes in the last 50 years: the hard-shelled zebra mussel, which clings to boat hulls and water intake pipes from Toronto to Chicago; the sea lamprey, which has been attaching its sharp-toothed orifice to salmon in Lake Huron for years; and the viral hemorrhagic septicemia (VHS) virus, infecting fish that wash up dead on Lake Huron beaches. This winter, as the carp slithered upstream, the Army Corps of Engineers considered closing the Chicago River locks four days a week, to prevent the Oriental aquanaut from swimming into Lake Michigan. 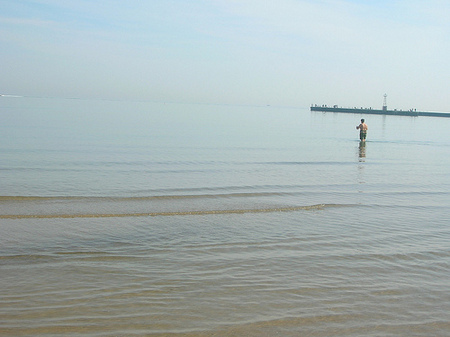 The Obama Administration announced a $2.2 billion plan to clean up the Great Lakes [PDF]. Its "zero tolerance" policy toward invasive species included funding for electric barriers to block the Asian carp, and ballast treatments to kill off creatures that stow away in the holds of European ships, or "salties." 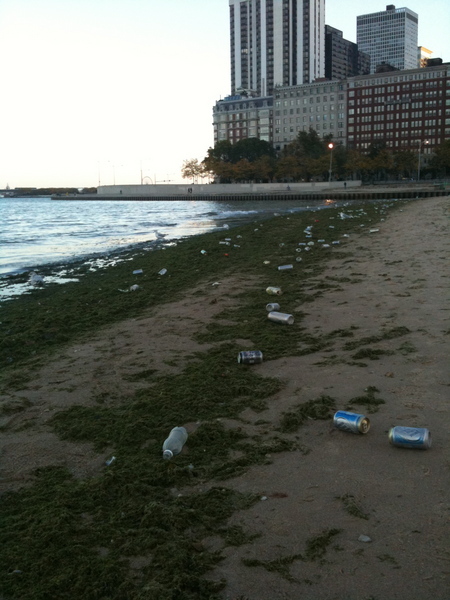 Trash leftover by careless beach dwellers already plagues several Chicago beaches in the summer and fall. The weather is finally getting warmer, and it looks as if people are bringing their bad habits to the Chicago River, which has suffered from severe industrial pollution for years. 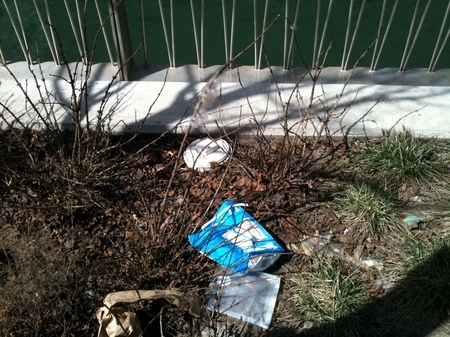 I recently strolled along the riverfront path on my lunch hour from State Street to Michigan Avenue and was disheartened to see wrappers, plastic bottles and discarded food all along the bank and in the river water. This garbage adds to the 1.2 billion gallons of sewage that is dumped into the river every day, according to Friends of the Chicago River. "The Parking Meters" will not mean just "the parking meters" in Chicago for at least another generation. The popular outrage over privatization of the city's parking meters was one of the largest expression of popular discontent of the Daley era, and caused a crack, albeit a fine one, to appear in the Mayor's monolithic governing coalition. Given as we are to think of government and politics as a collection of personalities, the Daley administration's ham-handed negotiation and rolling out of the parking meter privatization have taken center stage. The concession agreement has been treated as a political disaster, with reports that the entire lease was undervalued adding to rage over an opaque process. But are the projected sharp increases in parking costs and the potential coming of variable or market rate pricing projected over the coming years really a blessing in disguise? Indeed, urban planners have been arguing for more realistic parking costs in cities for years, and market pricing is increasingly looked at as a critical component to make cities more "sustainable" -- that is, more efficient, less dependent on exhaustible sources of energy, more carbon-neutral, and more conducive to healthy lifestyles. These (largely academic) planners looked at the abundance of cheap parking and deduced that the prevalence of cheap parking stimulated demand, and that the abundance was a result of direct and indirect government intervention. This is primarily in the form of mandated creation of parking in the zoning code. As a result, non-drivers end up subsidizing drivers, since developers build the cost of parking construction and maintenance into their business models. What's more, in outlying areas mandatory parking lots create expanses that incrementally push commercial and residential districts further and further apart, making alternatives to driving -- particularly walking and biking -- less feasible. A two for one solution appears: make parking sensitive to demand (i.e., increase the rates) and reinvest the revenue in foot and bike friendly urban design and public transportation. Result: efficiency and diversity of transportation options. Food deserts have become a concern du jour our city's political establishment, as the Big Blue Beast from Bentonville uses their existence as an excuse to bigfoot the retail market in Chicagoland. In previous posts I've argued that while food deserts are a problem, inviting in a corporate actor that tends to drive down wages and liquidate competitors (thus potentially just displacing food deserts) not to mention send profits back out of state isn't necessarily the best solution. Why not use some of that $70-million-for-the-Olympic-bid style muscle to raise funds for a program to encourage local entrepreneurs to step up and fill the need in the market, with proper quality and wage controls? Brianna Sandoval of The Food Trust, based in Philadelphia, Pennsylvania, discussed the need for understanding the needs of food retailers. In the Fresh Food Financing Initiative, a $120 million funding pool created by public-private partnership provides incentives to operators to open shops in areas where they might not otherwise have done business. Businesses have to be located in low or moderate income census tracts and areas considered underserved based on size of businesses and proximity from other stores. 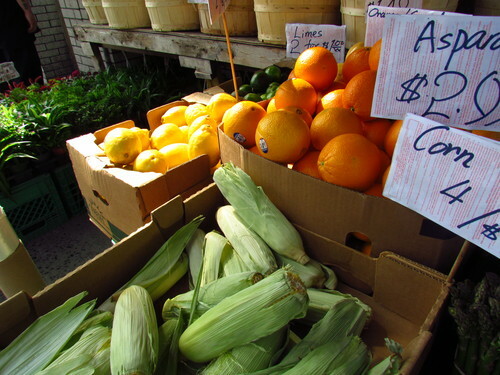 Programs also aim to improve access to healthy food in existing stores. In one case study, a local store increased sales from five types of fruits and vegetables to 20 types, and moved the fresh food to become the centerpiece of the renovated store. In another example, small refrigeration units for fresh fruit salads were added to a network of 40 corner stores. This change also resulted in new jobs as entrepreneurs moved in to provide the packing and distribution of the fruit salads. All of these programs demonstrate the financial pay-offs of integrating community food systems into a city or region's economic development plans. These are the types of solutions that would win the support and involvement of local residents--not to mention that they would likely come from locals if they had a real opportunity to participate in governing their city. Instead, they are just encouraged to beg for whatever meager jobs megacorporations are willing to dole out (that is, when those megacorporations aren't just fabricating that support). Whenever the weather cooperates, Blue Island resident Marci Frederick rides her bicycle from her home to her job as director of the library at Trinity Christian College in Palos Heights. The 49-year-old has been in a few small car crashes in her lifetime, so she prefers the serenity of a bike ride to the frustrations of a car any day. But without a strong trail infrastructure nearby that allows her to ride on bike paths or trails, Frederick mapped out her own route, where she purposefully avoids a more direct path along West 127th Street, a high-traffic road she stopped riding on after battling intense traffic and a chasing dog. In order to get to work, she crosses four sets of railroad tracks and winds her way down around nine different streets before arriving at Trinity about 40 minutes later. While she's generally happy with her current work commute, Frederick is one south suburban resident who is eagerly awaiting the opening of the Calumet-Sag Trail, a proposed 26-mile multi-use path that will be built along the banks of the Calumet-Sag Channel and Calumet River. The trail will run through many of Chicago's southern suburbs ("the Southland"), from Lemont all the way east to Burnham. The trail also will connect with other existing trails, including the Centennial Trail, creating a 150-mile trail system around the Chicago Southland. With the trail, estimated at a cost of $20 million, Frederick and other Southland bike commuters will be able to ride their bikes to work with more ease, and recreational trail users will finally have a continuous path to exercise on and enjoy nature. "As a first step towards making the Southside bike friendly, I think it's a great thing," Frederick says. "If it gets people out on trails so that they can appreciate what bicycling does and how much more efficient bicycling is than driving, I think that's great. For myself, the prospect of a practically door-to-door commute on the trail is wonderful." The Environmental Working Group's Facebook page pointed fans to some good reporting today. If you have some spare time this week, consider checking out some of the Milwaukee Journal Sentinel's great reporting on toxic chemicals and the frustrating efforts to get these chemicals properly regulated. According to the newspaper's reports, "Chemicals in the packaging, surfaces or contents of many products may cause long-term health effects, including cancers of the breast, brain and testicles; lowered sperm counts, early puberty and other reproductive system defects; diabetes; attention deficit disorder, asthma and autism. A decade ago, the government promised to test these chemicals. It still hasn't." One of the infamous chemicals reported on -- Bisphenol A (BPA) -- is found in food and beverage packages and many more household products. There is some good news for those of us who live in Chicago and are babies: In May, Chicago became the first U.S. city to ban BPA in baby bottles and sippy cups. But the chemical still lurks in several other products nationwide, and to make things worse, U.S. Food and Drug Administration officials have said they don't have enough power to regulate the chemical. The Journal-Sentinel reports that "because BPA was classified years ago as an indirect food additive, it is not subject to the kind of scrutiny that other chemicals are." And according to reporter Meg Kissinger's latest report, published yesterday, "In its ongoing investigation of BPA, the Journal Sentinel has found government regulators have routinely deferred to industry officials on questions of safety, even though hundreds of studies have linked the chemical to problems such as cancer, obesity, heart disease, diabetes, hyperactivity, sexual dysfunction and asthma." Read the newspaper's full archive of chemical safety stories here. Recently I posted an article on my Facebook wall about the scandalous release of a set of emails from some key scientists revealing their dishonest practices in the measurement and reporting of anthropogenic global warming. Along with the article I posted the message "it's about damn time people started asking legitimate questions." Said leaked emails revealed that these scientists essentially cheated. They tweaked data to make it say what they wanted it to say. I'm not here to talk about whether or not global warming is happening. I'm not a scientist, you're not a scientist (probably), and I'm not going to present any hard data to analyze. I'm here to talk about the nature of the global warming discussion. You see, the comments on the article on my Facebook wall quickly digressed into vitriol with liberals vehemently attacking me for posting the article at all, calling any discussion of the leaked emails - whether they be doubting the existence of global warming or not - stupid, irresponsible, and even intentionally ignorant. The quality of our water -- arguably the most precious natural resource -- is becoming increasingly screwed over by corporate bureaucracy, human laziness and ineffective governmental regulation. 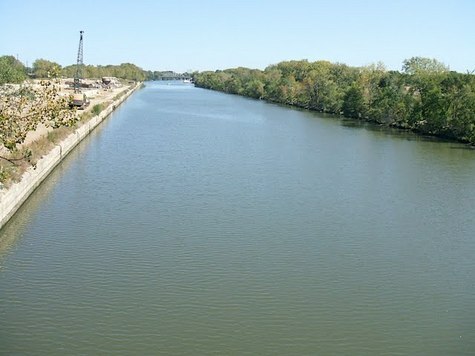 In a rather poignant report, the advocacy group Environment Illinois recently weighed in on the state's water quality in 38-page report titled "Wasting Our Waterways: Toxic Industrial Pollution and the Unfulfilled Promise of the Clean Water Act." 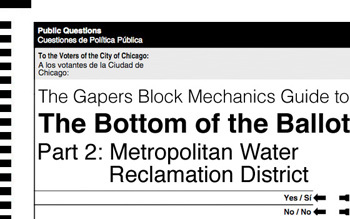 Mechanics plowed through the report to see how Illinois' water supply ranks. Members of Greenpeace recently uploaded a video on YouTube that shows activists fighting for climate action across cities in the U.S., including St. Louis, Raleigh, Chicago, Baltimore and L.A. Activists marched in support of International Day of Climate Action, held October 24, where environmentally-minded individuals gathered at key spots in cities worldwide to support the need for an international climate treaty and to raise awareness about climate change. In Chicago, dozens of activists gathered around the Fisk Generating Station at 1111 W. Cermak Rd. in Pilsen. 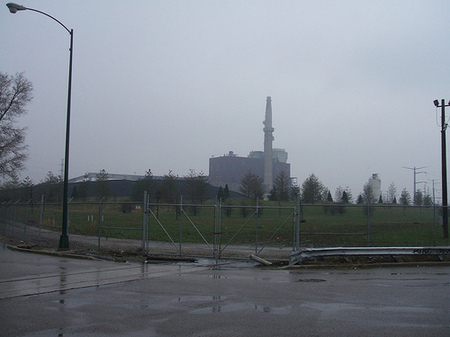 The coal-fired plant is one of the worst polluters in Chicago. At least watch the video until it hits our fair city (around the 2:01 mark) -- you'll hear activists ask how Obama's energy and global warming plan could let a coal-powered factory like Fisk, which is proven to contribute to the neighborhood's asthma problem, stay open. "Chicago claims to be a green city even though we have two coal-power plants located in predominately Latino neighborhoods," activist Moises Moreno, of the Little Village Environmental Justice Organization, says in the video. "The coal factories, we feel, haven't been held accountable for the violations they've committed." According to a Greenpeace rep, photos and videos from these events were delivered recently to delegates in Barcelona at the final UN Climate meeting. Activists are hoping their message is heard before critical discussions begin next month in Copenhagen. Chicago is now famous for installing millions of square feet of green roof across the city. How critical are these green roofs to the city's program for a sustainable stormwater management? They play an important role. However, we couldn't give credit to a new development for installing a green roof until we passed our storm water ordinance a couple of years ago. Now, every new development is required to calculate stormwater runoff and figure out how they can keep at least a half-inch of that first rain onsite for utilization and bioswales, green roofs, or other green infrastructure, like permeable pavements. Green roofs can play a significant role in stormwater plans for each site. You hear that, hippies? You wanna save the earth, you better start brushing up on those 200-page stormwater ordinances. Oak Street Beach is probably one of Chicago's toniest beaches in the summer, mainly because of its prime downtown location and the Oak Street Beachstro. It's almost always packed to the rim with tourists in the summer and usually pretty clean. Looks like things change in the fall -- fewer people, yet their Miller Lite cans remain. 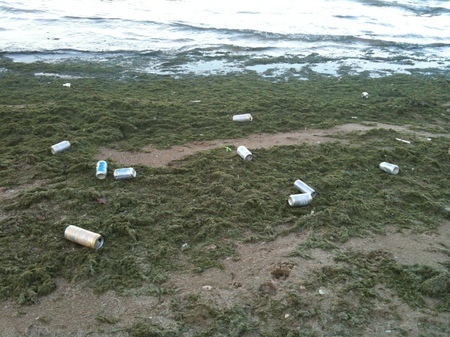 (And lots of algae). What Will Make Chicago More Sustainable? In July, speaking at an Urban and Metropolitan Policy Roundtable, President Obama announced an initiative to take a long, hard look at metropolitan development -- ways cities have failed and how planning officials can look beyond the concrete and streetlights to improve the quality of life. "For too long," Obama said, "federal policy has actually encouraged sprawl and congestion and pollution, rather than quality public transportation and smart, sustainable development. And we've been keeping communities isolated when we should have been bringing them together." At the roundtable, Obama recalled his time spent living in LA, New York, Boston, and Chicago, adding, "I received my greatest education on Chicago's South Side, working at the local level to bring about change in those communities and opportunities to people's lives...And that experience also gave me an understanding of some of the challenges facing city halls all across the country." This Chicago-centric experience has lead to a "conversation" tour, kicking off tomorrow in Chicago, where members from Obama's Cabinet will visit cities and regions across the country to discuss sustainable and responsible development. The Metropolitan Planning Council, a non-profit dedicated to creating "sustainable and prosperous" growth in the Chicago area, is hosting the luncheon, "Connecting the Dots: Metropolitan Chicago's Path to Prosperity," tomorrow from noon to 1:45 p.m. at the Hyatt Regency Chicago, Regency Ballroom (West Tower), 151 E. Wacker Dr. Mechanics took a Toxic Tour in the spring to learn about the factories that have been polluting Little Village for years. While environmental groups have been fighting to spread the word about the plants' dangers, little has been done to ensure environmental standards are being upheld, especially at the older plants that date back to the early twentieth century. Looks like there might be some good news on the horizon. The Alliance is launching a new project, and tomorrow we need your help. We're taking to the airwaves to raise awareness about the importance of the Great Lakes, the threats they face, and how everyone can help. The first wave of our new "This is My Water" campaign kicks off next week on radio stations throughout the Great Lakes region. Along with the radio announcements, a new website shows where to find information about water quality, water conservation, beach health and invasive species. From the website, people can learn ways to help improve the lakes in their personal lives, with business or government, and with the Alliance. How about a kind word for our cuddly Mayor? Inhabitat posts on the Mayor's initiative to "green" our 1,900 miles (over 3,500 acres) of alleyways, thus improving storm water run off and retention issues, remove impermeably services and urban heat island effects, among other potential advantages. The inititative is a refinement of Chicago DOT's existing alley program which focused on creating more permeable surfaces. Chicago alleyways, which outnumber those of any other city in the world, are lacking in proper sewer connections causing serious flooding issues. Rather than simply opting for expensive sewer hookups, the city started retrofitting alleys with permeable pavements and pavers. Our alleyways are one of my favorite things about Chicago. I have some very fond memories of running through and playing in alleys as a very little kid, and partying and otherwise escaping through alleyways as a man-child. Our alleys are a great asset and a great urban space; it's good to not just take them for granted, but always be thinking about what all that space--3,500 acres is a lot of acres--can be used for.